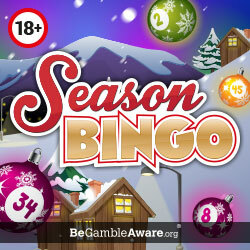 Season Bingo | Claim 120 FREE Bingo Tickets On Deposit! Season Bingo is a bit of an oddball because the theme is based on – you’ve guessed it – Christmas. Do you wish it could be Christmas every day? Well, you’re in luck because it’s Christmas all year round at this top bingo site. Whether you’re a Buddy or a Grinch you’re going to love playing here because there’s an extraordinary selection of games on offer and you won’t find a better bargain anywhere else. The site is part of the Ignite Bingo Network, which operates using a custom version of Dragonfish software and is licensed by Cassava Enterprises. In short, other brands that fall under this network include the likes of Rio Bingo and Crocodile Bingo, so you know you are in good company. Christmas is a time for giving so you can expect a generous welcome package packed with more goodies than Santa’s sack. Get started today and you will receive 120 FREE bingo tickets when you add just £10 to your account. Plus with zero wagering requirements, you get to keep what you win! Other perks include access to free bingo games as soon as you register, reload bonuses and plenty of ongoing promotions. 60 free bingo tickets on your second deposit. 30 free cards on your third deposit. Weekly £3,000 Festive Fun game. Earn VIP perks as you play. The festive season is all about giving, which is why all of the promotions are automatically applied for you! This means there is no chance of missing out on any of the rewarding offers. Season Bingo doesn’t have a dedicated mobile bingo app but it’s part of the Ignite Bingo Network so just like its sister sites it’s mobile optimised. This means you can play your favourite games wherever you go on your tablet or smartphone and regardless of what device you sign in from you’ll use the exact same login details. The elves have been busy in Santa’s workshop making games for you to play. The bulk of the games lobby is made up of bingo which isn’t surprising as it is a bingo site. There are three types of bingo games to choose from 90 and 75 ball games, plus 5 line bingo, all of which are spread across a variety of rooms. The only issue is that each game is absolutely fantastic so you’re going to have a hard time deciding what one to play first. We will warn you that the games all stick to the Christmas theme but forget the tinsel and turkey because you can play these games all year round. A good place to start is probably the Bingo Academy room which is a free bingo room open exclusively to new players giving you the chance to get a feel for the site before you spend any of your hard-earned cash. Once you get settled in there are lots of other free bingo rooms waiting for you. One of the highlights is the Jolly Jackpots promo which kicks starts your weekend every Friday from 7 pm. There are five games to play with each featuring a prize pool of £1,000. You’ll be ho-ho-hoing all the way to the bank if you manage to scoop up £5,000 without spending a single penny. As you can see you’ll have free bingo coming out of your ears when you join Seasonbingo.com! Even the games where you need to buy tickets aren’t that expensive. The tickets are all 50p or less (with most in the 5p-10p range) – even for the daily jackpot games. Not bad, eh? With big bonuses and cheap bingo tickets, you’ll find that your money will stretch quite far here. There’s also plenty of cash jingling on the reels! Season Bingo is home to some of the best slot games around including titles such as Fluffy Favourites, Jimi Hendrix, Cleopatra and Gonzo’s Quest. 120 free bingo cards on first deposit. Free tickets on 2nd and 3rd deposits. Free phone number for customer services. Banking methods include Mastercard, Maestro, Visa, Neteller and Paysafecard. Withdrawal process can take up to 10 days to complete. Free bingo no deposit sites don't come much more rewarding than Season Bingo. There is also unlimited access to free bingo games and a rewarding first deposit bonus giving you 120 free bingo cards. Plus there are plenty of 1p penny games and big jackpot prizes to win without breaking the bank. If you like good value and a reasonable chance of winning, this could most definitely be the site for you. Add in the fact that that, if you fancy it, there are some huge jackpots to be won on slots, this really is a bingo site for everyone.